Paige Taggart is from Northern California and currently resides in Brooklyn. She is the author of two full-length collections, Or Replica (Brooklyn Arts Press, Dec 2014) and Want for Lion (Trembling Pillow Press, March 2014) and 5 chapbooks, most recently I am Writing To You From Another Country; Translations of Henri Michaux (Greying Ghost Press). She has her own jewelry line (mactaggartjewelry.com) that specializes in blinging-out poets. 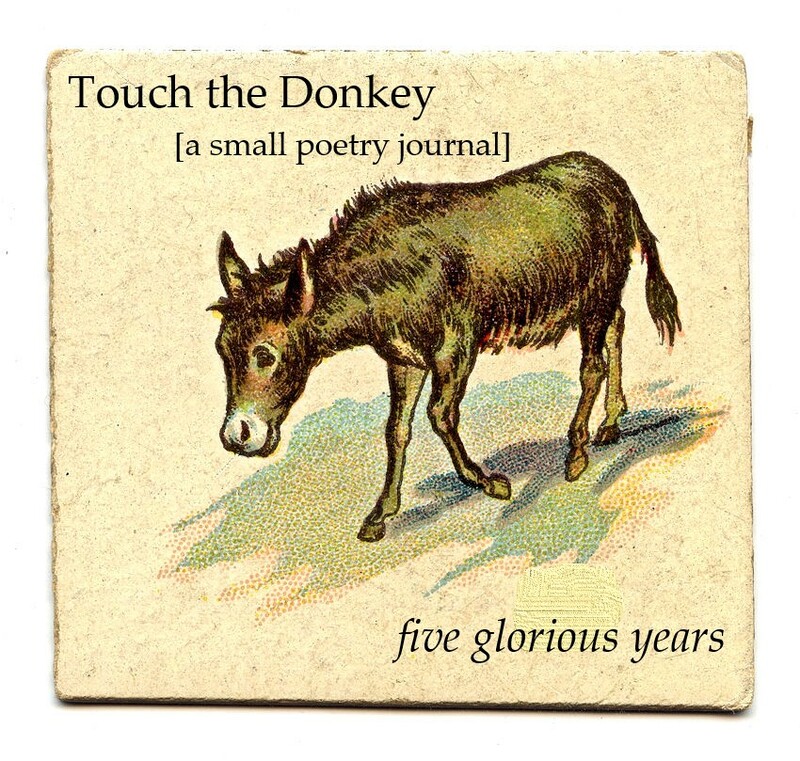 Her poem “when i dream of a lover a lover dreams of me too” appears in the fifth issue of Touch the Donkey. A: The poem attempts to create a transient state of intimacy, not so much personal intimacy directly, but more an intimacy bound to the poem that is carried over into the reader so that the reader is then, hopefully, bound in this way of intimacy too.... Like an infinite reach for the grander, like an echoing of a mathematical sequence. I was opened by music & made willing & vulnerable to write the poem; I was trying to detach from a body, to be an out-of-body experience. Q: From what I’ve seen of your work, you seem to favour larger groupings of poems as opposed to stand-alone pieces. Is this part of a larger project of some sort, perhaps even a book-length work? A: Yes, I very rarely write an individual poem that stands alone and not in the company of other various parts or paragraphs. This piece was written all in one sitting and it doesn’t feel like a part of a larger project quite yet. Maybe at some point it will be. But it will probably end up in the most recent work at hand, which is a manuscript made up of many different styles. I call it a mixtape, at this point, but we’ll see. Q: I like the idea of a poetry manuscript-as-mixtape, which sounds different than the way you built your first two books. How were the first two manuscripts constructed, and what prompted the shift in construction for your current work-in-progress? A: The work-in-progress is certainly a shift as both of my books were constructed/written with the whole in mind, specifically sections & styles. I worked in sequences and relied on length to fully flush out a concept or idea that I had shaking around in my skull. One example from Or Replica, the prose sections of the book were really concerned with place/location and how memory affects our most current psychological states. Now, it’s fun & flirty to write occasional poems, or poems that work to stand alone, partly because I don’t feel as compelled to put a book out any time soon, so there’s less pressure to think with regard to book form. So I’m being more myself in some ways, and just writing for art’s sake. The potential of the mix tape is that it contains more music than ever my writing has before. Q: What is it that allows you to put aside the pressure to write “with regard to book form”? Was the pressure of wanting to publish pushing the ways in which you put together your first two collections? Q: I’m not sure how far you are through your “post-book” process, but are you noticing any shifts in your work now that you’ve allowed yourself some freedom from the pressure to publish a book? Is there anything emerging in your poems that you might not have expected? Are there directions you can finally bring yourself to explore that you couldn’t before? A: I notice the octopus tentacles of varying differences; I don’t really know what I’m writing exactly. A lot of this feels like just “writing” and less like trying to make poems—included is the flexibility to stretch into more an essayistic mode of writing and then I come back to poetry & kind of delve in-and-out of various modes of speech. I wrote a play a long time ago and I’m working on having a few friends act it out. The performance is not super dramatic. It’s more a dialogue. I also wrote a recent piece that’s kind of a lyric essay that came to me in the form of a dream, and I woke up and wrote the dream down and allowed for various transformations to take place. This piece addresses the very act of writing, which I am deeply questioning. I like exploring that, and I also feel okay with being more political than I used to be. And about eight years ago I made an attempt at writing a novel, it’s really bad, but I think about doing something with that piece, maybe putting it inside of a memoir type framework—like acknowledging that this happened—ha-ha—that the failure is beautiful! I don’t think I have a particularly interesting life that begs for a memoir, but it is something I think about. I am super interested in memory and the way it plays a role on my current psychological states, and I think a memoir would allow for a kind of vulnerability unmasking, and that maybe it’d help me get over a bunch of my “issues” but I don’t think the writing would necessarily need to be shared or be a book ever! Q: What role do you think memory would have in memoir that you aren’t able to explore through poetry? A: I feel like memory in poetry is something I’m capable of dipping in & out of but I don’t want to occupy that plane for too long. Poetry is quicker & less about perfectly laying out a vision/landscape/place & persists in that space, occupying all its senses, familiarities & just general formal description. It would be boring for a poem to linger in one place for too long. I like poetic jumping. I like using a memory as a taking off point & then venturing somewhere radically different to keep things in motion—movement & music are key for me in poetry & come way before meaning—looking for meaning means establishing a fixed point with which to attach a concept or idea, often declaring itself through metaphor etc. I want to mean a million things & embody much more space than a narrative allows for. I think if asked to write a memoir of myself it would slow me down. It would be to study specific occasions much more microscopically. A: I don’t return to any particular writing to reenergize my own work—I always think about other writers and elicit particular moments, phrases, or narratives in my head. I always come back to certain story lines that served as literary experiences for me like in Cesar Aria’s books. After having translated the work of Henri Michaux, I feel fueled by thinking about his work and how it can be read and experienced on so many levels. On a day-to-day basis I quote my boyfriend Sampson Starkweather’s poems in my head or aloud. I listen to music & podcasts to move me out of myself. I think about my friends’ poetry all the time. I don’t have a mentor or a certain fueling agent; it shifts constantly. Every time I read a good book it makes me want to write more. I just finished an excellent first book of poetry, Undercastle by Feliz Lucia Molina.